I've been adding more and more Bobbi Brown makeup into my collection and while I can probably find dupes for a lot of the shades and the formulas are nothing extraordinary, I can totally see the brand's appeal. While the Insta-famous are chasing after the latest limited edition unicorn highlighter, I'm longing for makeup staples that can carry me through a work week and into the weekend without any fuss. No offense to those who are into lavender shimmery cheek products but that's just not my aesthetic. Anyway, I digress. Bobbi Brown eyeshadows have been on my radar for years but they're $25 a pop and it's hard to justify spending so much on a neutral single shadow when palettes with a dozen shades are often around $50. I recently caved and bought three of her singles because there was a $30 off $80 Gilt deal and a really nice gift with purchase. Bobbi Brown does some great gifts with purchase directly through their site so I recommend signing up for their e-newsletter. 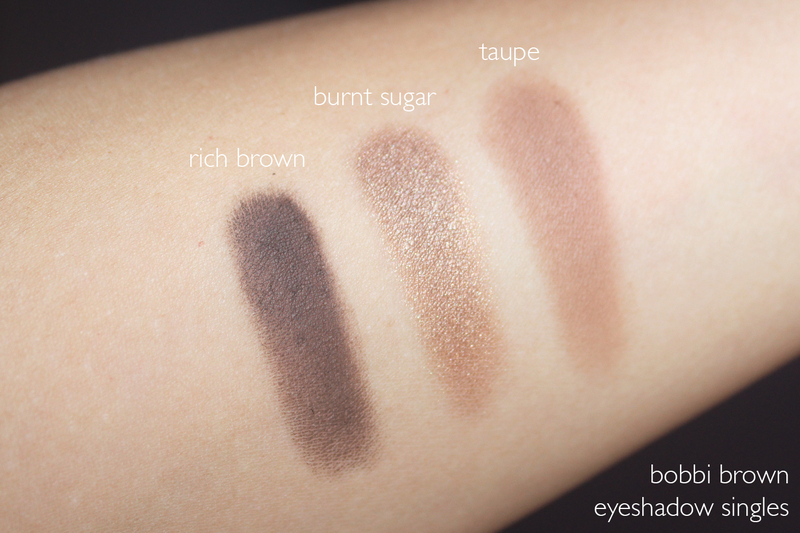 The shades I chose were Rich Brown (matte dark brown), Taupe (matte beige) and Burnt Sugar (metallic golden brown). No surprises - all very neutral, wearable tones of brown. I figured these would all go together but I could also bring Rich Brown and Taupe with me when I travel because they're staple blending shades. I could have easily purchased similar shades from Mac for only $6 per refill pan but alas, I wanted to see what Bobbi Brown had to offer. While the shadows are pricey for singles, you get a lot of product in each pan. Here's a comparison shot of the shadows next to a Mac single and a Clinique Cheek Pop. Each Bobbi Brown eyeshadow is 3 g (.1 oz) whereas a Mac eyeshadow is half of that and the Cheek Pops are 3.5 g (.12 oz). The single eyeshadows also pop out of their individual cases and Bobbi Brown sells customizable palettes with 3, 4 and 6 wells ($10 each) so you can mix and match your own palette of eyeshadow and blush shades. It's a nice, albeit expensive, option for those who want to make your own sleek palette. Onto the fun part - the swatches. I am happy with the pigment and texture of all three shades that I purchased. Burnt Sugar is quite a popular shade from the line and I can see why. It's one of those universally flattering shimmery brown shadows that you just can't go wrong with. While it's labeled a metallic finish, which makes me think of a very intense foiled look, Burnt Sugar has a very refined shimmer. It's really lovely and I experienced no fallout when I applied it all over my eyelid. I'm also very pleased with Rich Brown. It has the perfect amount of pigment that enhances the eyes but is a breeze to blend out. No chalky mattes here! 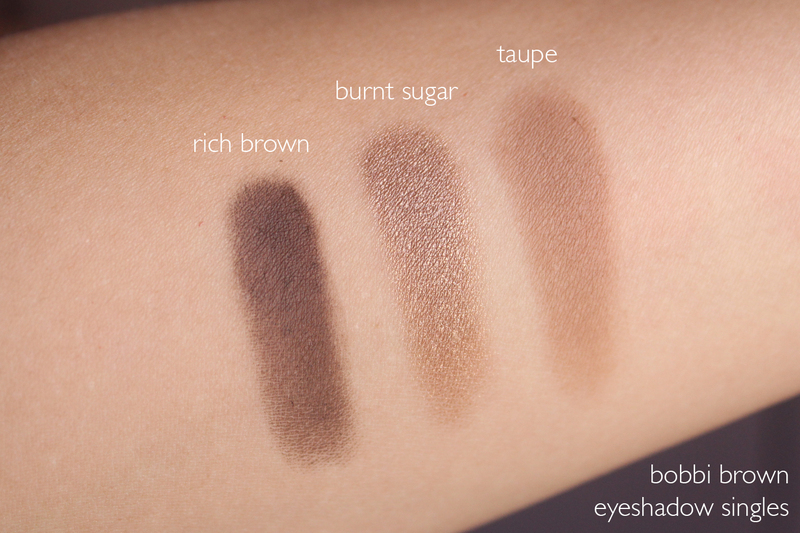 Taupe is a great transition shade and I love the tone for the crease or even all over the eye. I found this shade a bit more difficult to blend for some reason compared to the other two which was surprising. But it wasn't anything a few extra seconds of windshield wiper motions with a fluffy blending brush couldn't fix. I took another photo with flash which captures Burnt Sugar's luminosity a bit better. It's a very pretty shade and one that I think would look nice on pretty much everyone because it leans neither too cool or too warm. I did a very textbook eye look with Taupe blended generously in the crease, Burnt Sugar all over the lid and Rich Brown in the outer corner and I loved how it turned out. 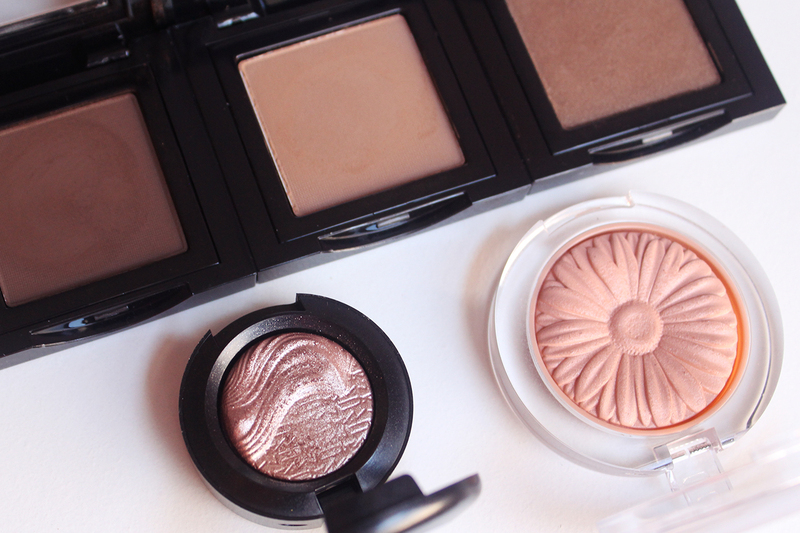 You can't mess up with these three shades. Bobbi Brown does a lot of limited edition eyeshadow palettes with many of their best-selling shades so I would keep an eye out for those if you want to nab these shadows at a better price. Do I wince knowing how much I spent on these given I can probably find close enough dupes already in my possession? Yes. Do I still love these shadows and see myself using them a lot? 100% yes! If you wear the same makeup look everyday and want functional products that get the job done well without the bells and whistles, Bobbi Brown likely has you covered. 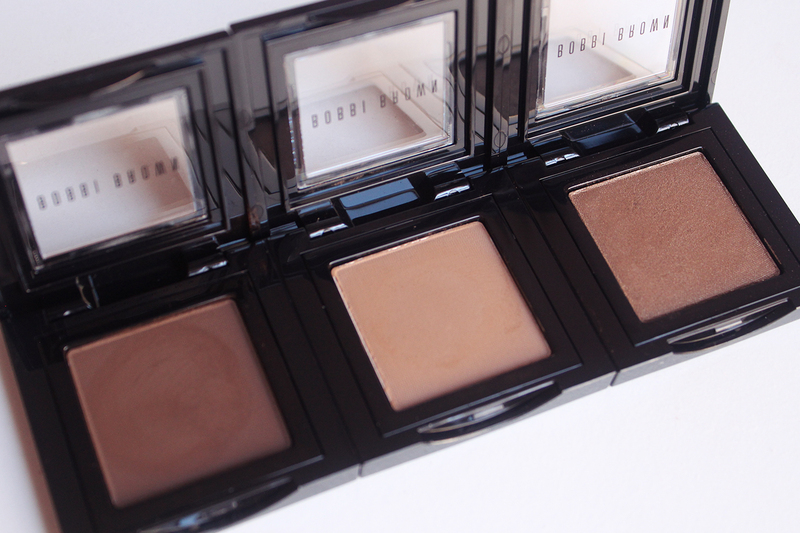 What are your favorite products from Bobbi Brown? Any recommendations for what I should try next?